River Report -- April 12 Ben Statewicz and his father Harry put in a six hour shift before wind/rain/ and a touch of hail drove us off of the river early. 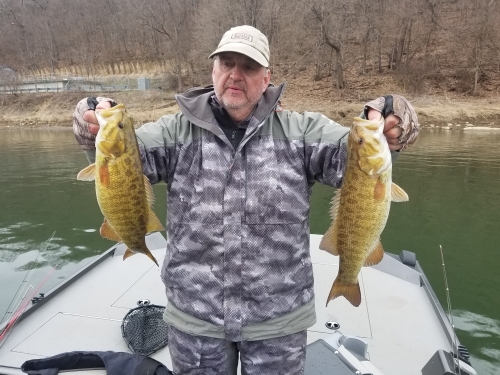 Bass were a little more scattered today than in recent trips but they worked hard in windy conditions and put a nice bunch of fish in the boat, including several brutes up to 19.25 inches. Finesse tubes, Galida's Grubz and hair jigs all accounted for fish. 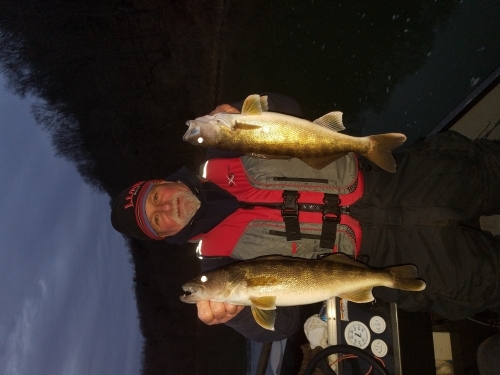 River Report -- April 9 Red letter day on the Allegheny today for brothers Dave and Ed Novak of Akron, Ohio. 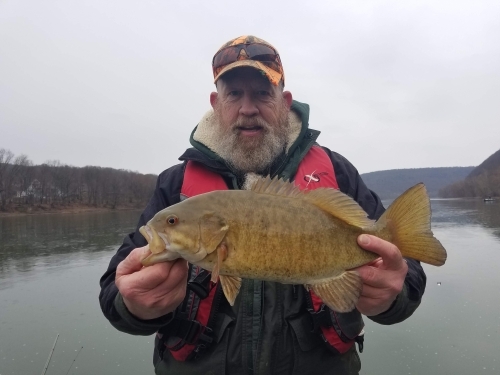 Big numbers of big smallies including the best one of the year so far, a 21 incher that pulled the scale down to five pounds even. Got most of them on Galida's Grubz. Some on hair jigs too. Water temp up to 50 degrees. River Report -- April 6 Regular client Steve Gierl had a great six hour outing this morning. Lots of big smallies along with bonus walleye and northern pike. Finesse tubes and grubz. Water temp on the way up. River in great condition. I still have a couple weekday openings upcoming week. 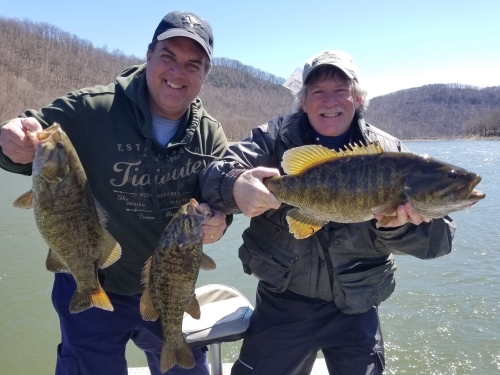 River Report -- April 5 Had the pleasure of having fishing legend John Galida join me this morning during a very enjoyable outing. A pleasure swapping "war stories" with such a talented angler, one whose fishing career spans multiple decades. 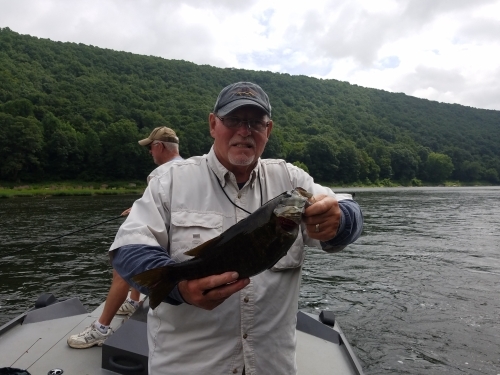 In between tales we managed to put a bunch of bruiser smallies in the boat along with three nice 'eyes. Got them on Z-Man Fishing Products TRD TubeZ, CrawZ. And of course the hot bait was the Galida's Grubz. Water temp 42 degrees. Bass are staging up as they move out of wintering areas. The next few weeks should be awesome. 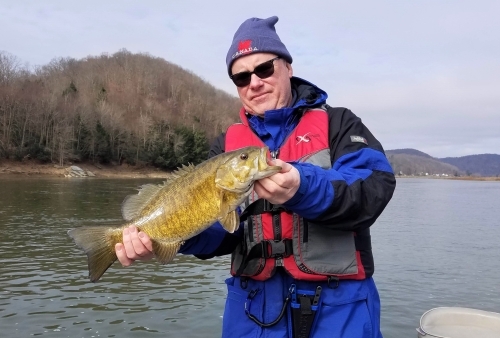 River Report -- March 31 Great mid-morning to mid-afternoon trip with river smallmouth ace Eric Heil. A bunch of big smallmouth. Most from 15 to 20 inches. Only three or four less that 15. Z-Man Fishing Products TRD, TRD Tubez and Crawz were all hot. Nasty cold, windy day, but a big shout out to Simms Fishing Products for producing outstanding foul weather gear. The springtime bite is on! Lots of dates booked during the next few weeks but openings available too. Give me a shout to set up a trip! 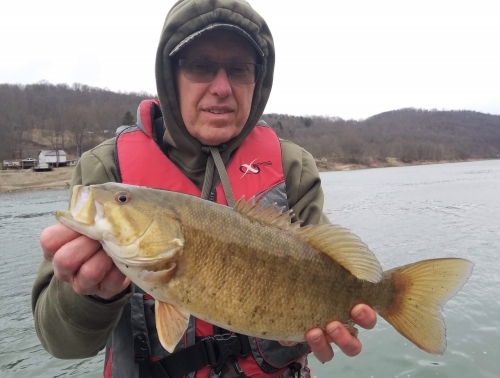 River Report -- March 26 A productive late morning-to-mid afternoon scouting trip on the middle Allegheny for smallies. Got most of them on Z-Man Fishing Products finesse tubes. 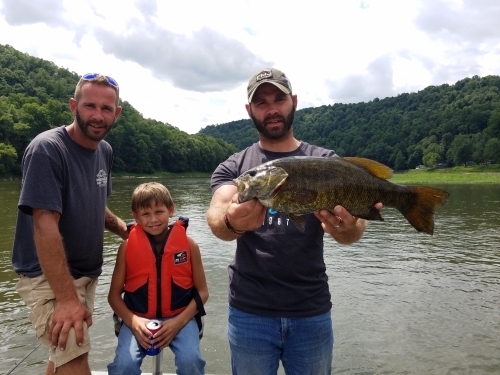 During the past week we've caught smallies in the Oil City, Parker and East Brady areas. River guide trips for smallies will begin in earnest in about a week. Lots of dates booked, but plenty of availability as of now. 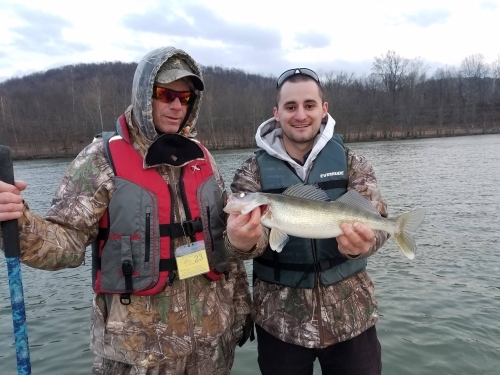 River Report -- March 24 Back on the middle Allegheny this afternoon. Had to work for bites but ended up with some nice smallies, walleyes and northerns. 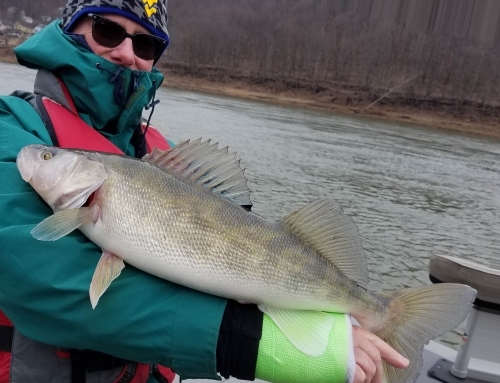 River Report -- March 14 The last day of winter/river walleye fishing ended on a high note. 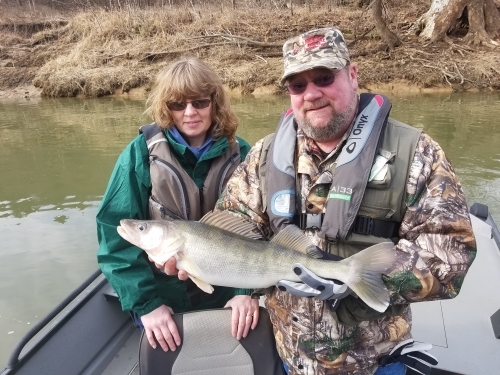 Steve and Teresa came down from the Tionesta area hoping to pick up some tips they could use on their section of the Allegheny, and were pleased with the results. During a half day trip, from mid morning to mid afternoon to keep ahead of the wind and rain, we boated a dozen nice 'eyes up to 25 inches. The big females were released. They took home a single limit of males in the 16 to 18 inch range. Berkley Gulp Alive minnows tipped on leadhead jigs was the hot presentation. 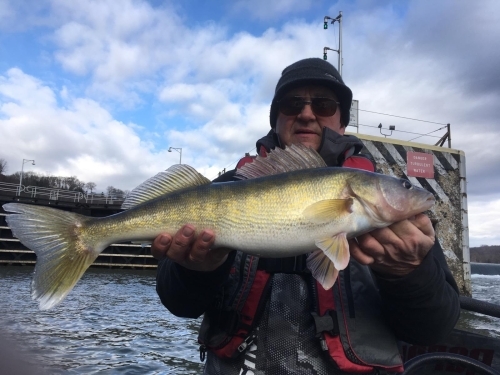 River Report -- March 13 River walleye fishing is wrapping up for the winter as the season closes tomorrow night at midnight. 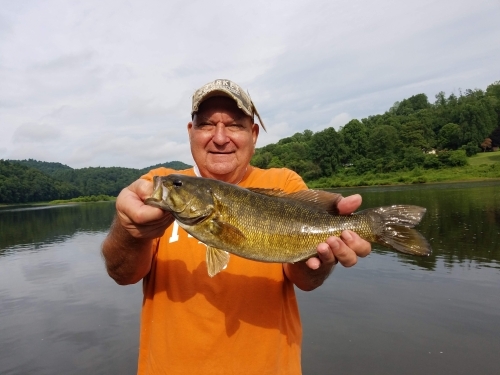 Recent trips on the lower Allegheny have been slow, with a good bite at twilight. Today's trip on the middle Allegheny produced a bunch of nice 'eyes from 17 to 25 inches. One more guide trip tomorrow for river walleye, then we'll be switching to river smallies, and walleyes on Pymatuning and Mosquito. 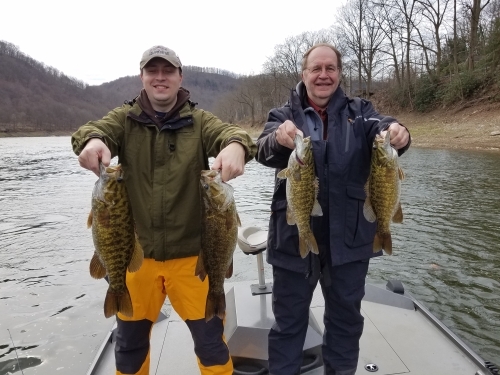 River Report -- March 2 New clients John Jr and John Sr. of the Apollo area joined me for a half day outing on the lower Allegheny. Slow start but they turned on toward dark and the guys boated a bunch. All between 14 and 17 inches. 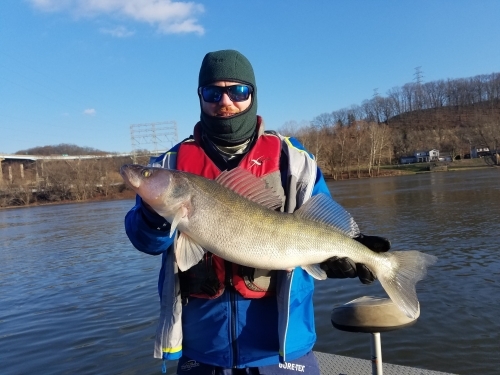 River Report -- Most recent trips have been on the lower Allegheny River. 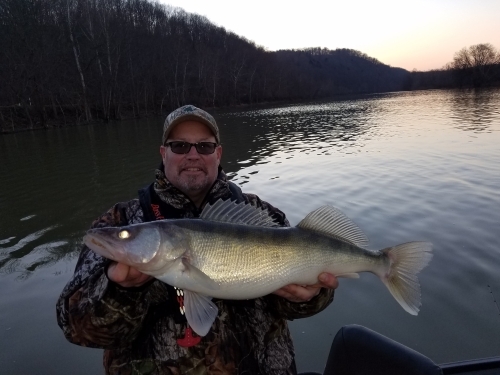 Walleyes not as big as the ones getting recently on the middle Allegheny, but some good eatin' size 'eyes. A nice musky as well. Still a couple weeks left in walleye season. Weather looks cold through the upcoming week with things moderating Friday. Give me a shout if you're looking to get in a trip during the final days of walleye season, which will reopen early May. 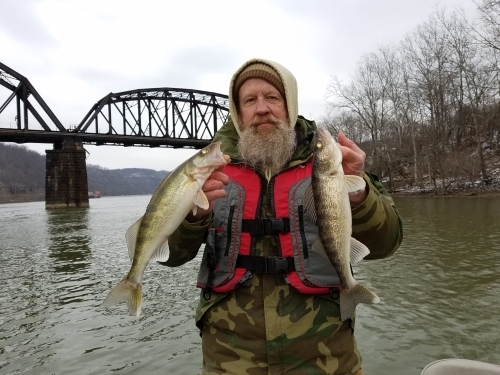 River Report -- February 23 Longtime client Steve G. joined me for a half day morning walleye trip on the middle Allegheny. Despite having a cast on his right wrist he put a bunch of nice walleyes in the boat, as well as a 35 inch musky. 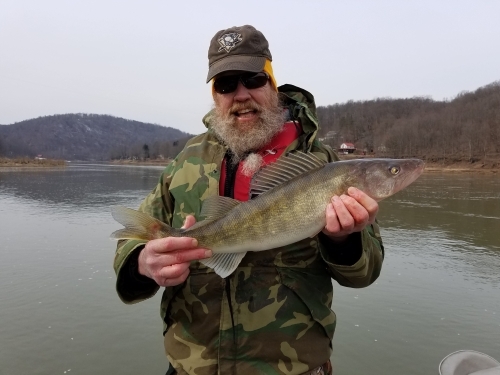 River Report -- February 22 Excellent action on quality-sized walleyes on the middle Allegheny the last two days. Lots of fish in the 17 to 25 inch range. Still about three weeks left before walleye season ends in mid March! River Report -- Jan 8 Regular client Patrick B. was joined by his son Reid (sp?) for an afternoon trip on the lower Allegheny that proved to be quite interesting. Walleye's were finicky, but we boated a decent amount. Largest was 25 inches but the rest were small. Also lost a fish that was likely a huge walleye. Had a 40 inch musky to the net. And got pelted with 1/2 diameter hail just as we got to the ramp. River Report -- January 7 With the level on the middle Allegheny finally dropping down to a reasonable level my buddy Sid and I did a scouting trip. After a delay due to freezing rain and icy roads we got on the water around 11. A very productive afternoon with a bunch of nice walleyes in the 16 to 21 inch range. 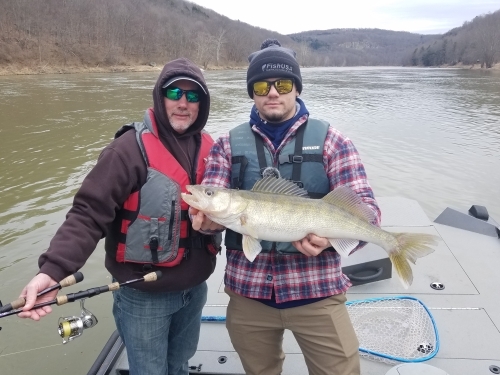 River Report -- Jan 5 Randy E. and his son Jeremy made a 3.5 hour trek from Lancaster and put in a full day on the lower Allegheny. We had to work a bit harder for bites today, but they boated a bunch, and ended the day with this 27 inch, 8.6 pounder. Everything on jig-n-minnow today. Fishing Update -- January 2 It's been walleye, walleye, walleye the past month or son. 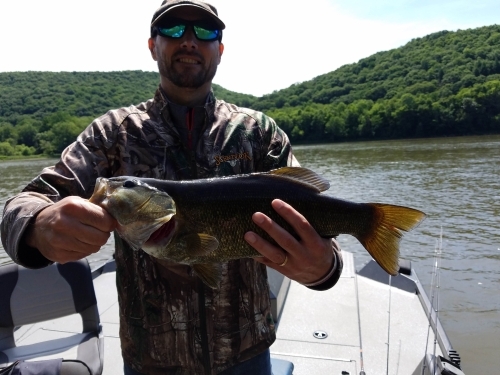 We're catching good numbers of 'eyes on the lower (navigable) Allegheny River. Lots of little ones, but a fair number of eatin'-sized keepers. And we've gotten some monsters this fall as well. Most of our trips have been four and six hour outings, ending at dark. But I can do full day trips as well, providing the morning isn't too cold. Remember to "like" my Facebook page, where I post fishing updates after nearly all trips. Fishing Update -- Nov 11 Please forgive the absence of fishing updates on this page. Fall fishing on the middle Allegheny has been good when the river has been in decent shape. 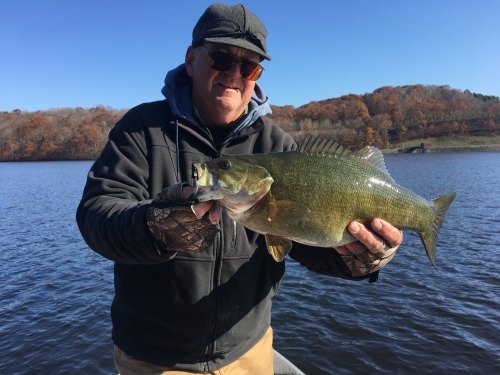 Lots of smallies, plenty of big ones, and some good walleyes as well. When the river has been too high to fish, as it has been the past two weeks, we've been catching some big smallies on Keystone Power Dam. For more frequent fishing updates, "like" my Kesytone Connection Guide Service Facebook page, as I issue reports after nearly all trips. 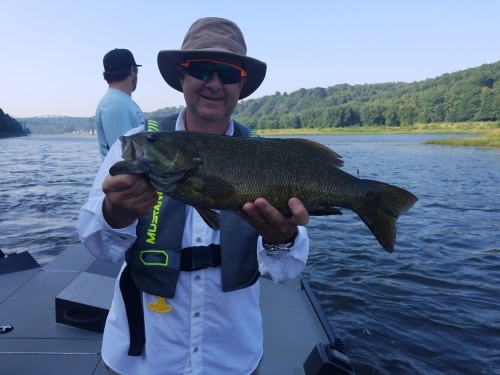 River Update -- August 28 Action on the Allegheny continues to be good. Getting good numbers of smallmouth bass up to 20 inches as well as some bonus walleyes. I expect summer patterns to continue for another month to six weeks. So if you're looking to fish for smallmouth bass in shallow, moving water, there's still plenty of time for a trip. River Update Aug 8 The river is low, clear and warm (as of Aug 8). The bass are there to be caught, but we've had to work for them. Today's trip put two dozen in the boat and a bunch of other lost. Getting them on Rapala X-Raps, flukes and Z-Man ShadZ. River Report -- July 31 My friend Wes Wasik from Houston fished the second of his four-day booking with me today. We got smallies up to 17 inches and a 21 inch walleye. On both flukes and Rapala X-Raps. River Update -- July 27 The Allegheny has been in summer mode for the past few weeks. Finally got down to a more typical level after a wet spring and early summer. Getting lots of bass on Rapala X-Raps and soft jerkbaits. Spinnerbaits when the river's been off color. Today's trip yielded over 40 smallies along with a couple nice walleyes. Biggest bass was over 4 pounds. Be sure to like my Facebook page, where I log updates after nearly every trip. I'll continue to provide fishing reports here as time permits. Middle Allegheny River Update -- June 27. The river has been off color much of the past couple of weeks. We're getting some nice opens, mostly on spinnerbaits, but the numbers have been down (typical of things when the water's dirty). Spinnerbaits and flukes. 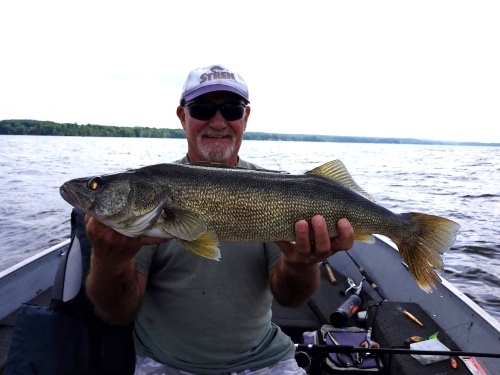 Pymatuning Walleye Report -- As of late June, we're catching some very nice walleyes on Pymatuning. Not racking up big numbers, but getting walleyes up to 25 inches. I'm only doing full day trips to Pymy. Get in touch with me if you'd like more details on available dates and such.